The forecast was good, not brilliant but good enough to head west for our day's fishing. Rainbows were the order of the day. 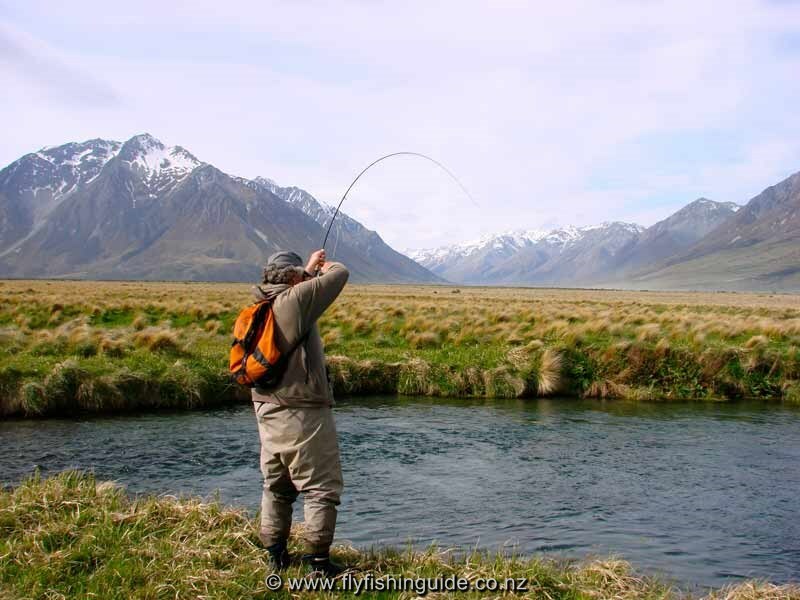 In this part of New Zealand we have a great mix of brown and rainbow fisheries and although they are usually found together one species often is more prevalent than the other. Jim, a new client, was eager to get out on the water. He and his good lady Nancy had been touring around the country for some time but only getting out for a fish on the odd occasion. 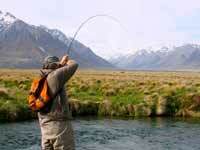 Really "cool" and out to enjoy his day, Jim proved to be a very competent angler and great company to boot. I discovered that Jim's 2 sons are both professional guides in the US so we were "in family " for the day. We began by observing 2 rainbows on station one behind the other but I could see that it wasn't going to be easy. Not much movement so food was obviously scarce. That usually means hard to catch and spooky fish! Jim produced a careful cast and the trout visibly saw the fly but was not interested. A change to another pattern and a good presentation followed. This time the rainbow slowly rose to collect the floating morsel - fish on! Jim nailed another 2 nice bows even though the fish were unco-operative proving that persistence and patience pays dividends! 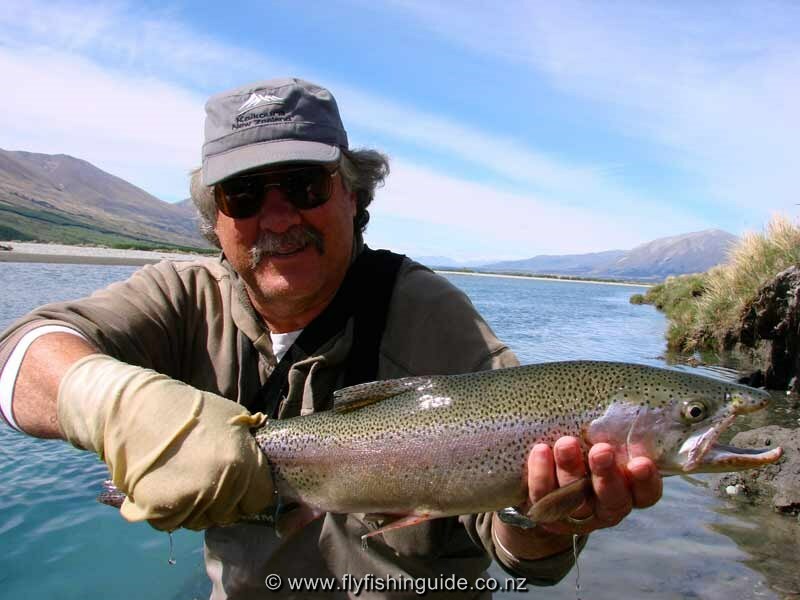 Jim giving Kaikoura some free publicity with a classic back country rainbow. No harm done! 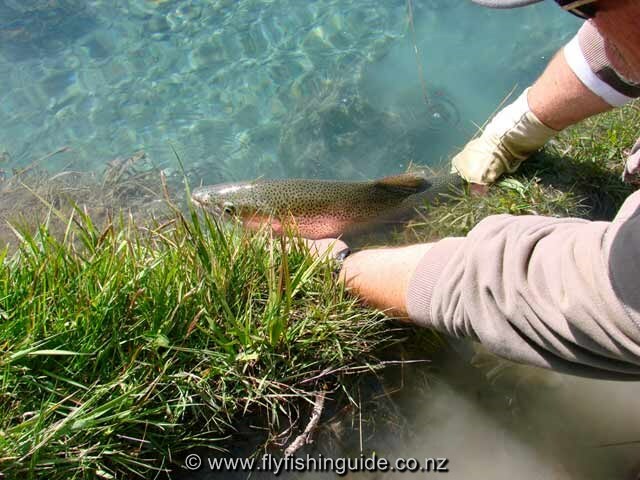 This fish is released after a quick photo All guides like to see a bend in the rod like this! Jim into another fish.